Queens home sales in June decelerated for the fourth consecutive month. Strong demand and sustained ultra-low mortgage rates continue to overpower constrained inventory levels and a rising median sales price. Prior to March, we were seeing an uptick in home sales, however, since then, we have been seeing sales decline, which can most likely be attributed to the low inventory levels across the county. Absorption Rate: 674 sales/per mo. Interest rates decreased slightly from the month prior and remain at historically low levels. Mortgage rates have recently declined due to increased uncertainty surrounding the global economy prompted by the UK voting to leave the European Union. The Long Island Board of REALTORS® reported Queens home sales at a seasonally adjusted annual rate of 674 homes during the month of June. This was an increase of 5.8 percent from May, and a decrease of 8.2 percent from June of last year. Specifically, Residential 1-3 family Queens home sales were down 1.7%, Queens Condo sales were down 16.4%, and Queens Coop sales were down 15.8% compared to this time last year. 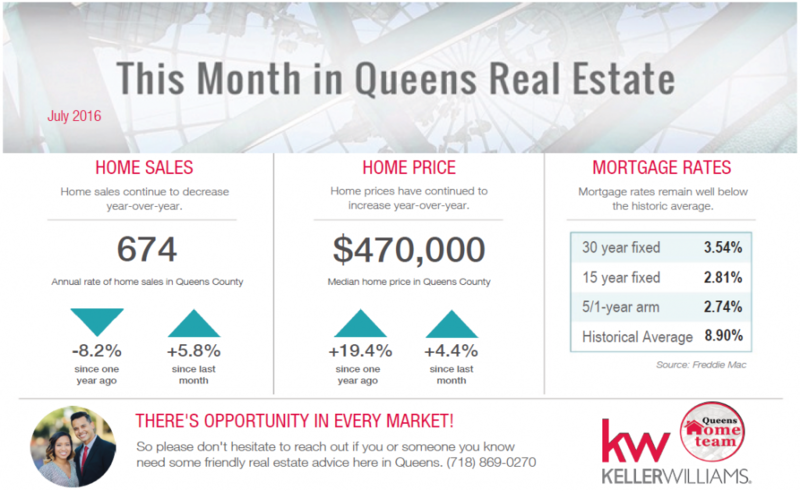 Over the last 12 months however, Queens home sales are up 1.4%. The median home price in Queens reached a record $470,000 in June, which was up 4.4 percent from May and up 19.4 percent from June of last year. The median home price in Queens has increased by nearly $76,250 in the past year alone. Specifically, Residential 1-3 family Queens home prices were up 11.6%, Queens Condo prices were up 10.5%, and Queens Coop prices were up 2.3% compared to this time last year. Over the last 12 months, Queens home prices are up 7.5%. There was a 5.7-month supply of Queens housing inventory in June, which remained pretty flat from May. The total number of Queens homes for sale decreased by 12 percent compared to June of last year to 3,812 homes county wide, which was 521 fewer listings than June of last year. Specifically, there are currently 2,458 residential 1-3 family homes for sale, 365 Condos for sale, and 989 Coops for sale in Queens county.